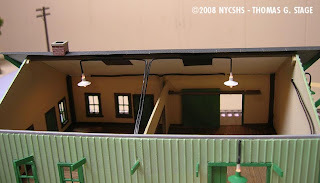 Many years ago, Alexander Scale Models released an HO scale kit based on the New York Central freight house at Caledonia, Michigan. 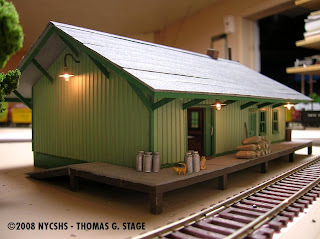 We present Tom Stage’s completed model, to which he added lighting and a semblance of an interior that is viewable through the open freight doors. The kit consists of milled wood walls, stripwood for framing and bracing, and metal castings for windows and doors. The kit is currently out of production, but may be available in the future as Tomar Industries has now assumed stewardship of the ASM name. The exterior walls are light green, represented by mixing Pollyscale Italian Camo Greeen with Pollyscale Reefer White 1:2. The trim and windows were painted with Floquil Dark Green. The platform and eaves were painted with Pollyscale Light Gray. The lamp shades are Floquil Dark Green with Primer White inside. The interior walls were painted with a custom mix of Floquil Earth and Reefer White 1:3. The floor and trim are Floquil Roof Brown. Tom also added working sliding doors, a detachable roof to access detailing, and a center beam to support interior lighting. The lamps are Miniatronics 12v-30mA, 1.7 OD incandescent bulbs (part no. 18-712-10). Originally built in 1868 by the long defunct Grand River Valley Railroad, the Caledonia station was leased in perpetuity to the Michigan Central Railroad in 1870. This line (which originated from Jackson) was the New York Central’s main line to Grand Rapids, Michigan’s second largest city. Passenger service ended in 1959. The line was abandoned by NYC successor Penn Central and operated briefly by the Kent, Barry & Eaton Connecting Railroad, with a state subsidy. State money ran out and the rails were removed in the 1980’s. Freight and storage facilities occupied the rear, larger, portion of the building. The front hall is divided into two smaller rooms. One served as the passenger waiting room. The other part served the agent’s and telegrapher’s office. The depot, still in its original location, is used for storage by the lumber yard across the street.